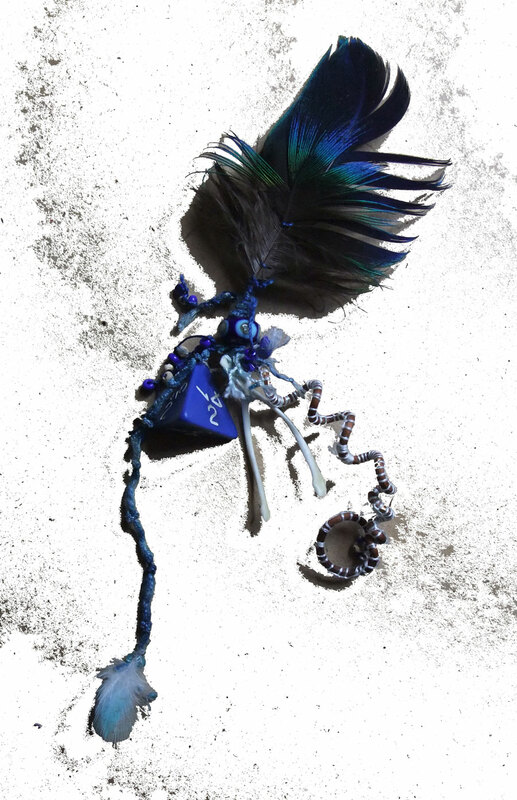 peacock feathers, lampworked glass bead by Kathy Dorfer, indigo dyed silk cord from Dee Mallon with tiny blue budgerigar feathers stitched in, triangular die from Dungeons & Dragons, one of Ariel P. Cat‘s collection of quail wishbones, grapevine tendril wrapped in silk steel, lapis lazuli, vintage glass & clay beads from Africa, blue beads from New Orleans via India Flint & Roz Hawker in the Bower Bird Blues workshop, this piece of blue is for Tarla Elward of Tamborine Mountain Indigo who hosted the workshop with such grace. I do love making them but it’s time to get back to the editing! Wow, amazing, and what a collection of artifacts. Your friend Bronwyn weaves, beautiful work couldn’t work out what her large woven wall piece was made of though. All those small pieces telling a story, past and present, ready to carry into the future . . . it’s wonderful. I often pick up small pieces from the beach . . . I shall weave some in to a small magical bundle. 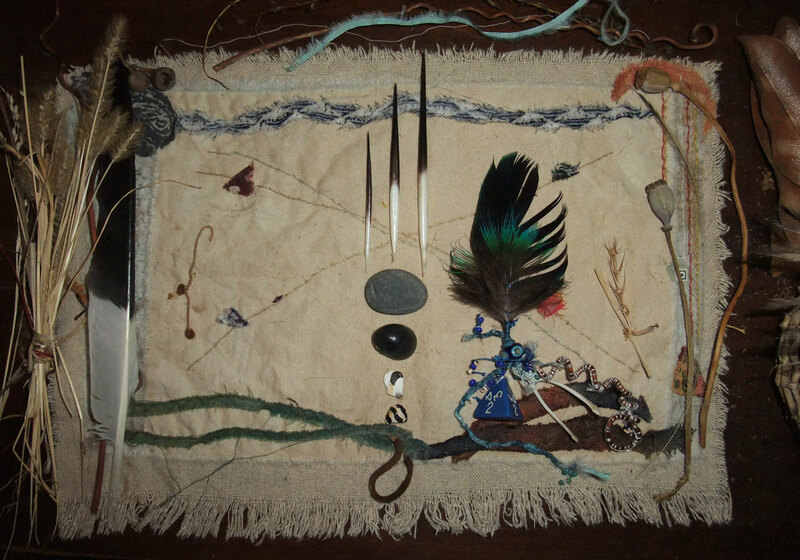 I made 7 talismans & 1 amulet for the Collector’s Show at Artsite Gallery last year, here’s the link, then the indigo amulet at the Bower Bird Blues & look forward to making B&W (with a dash of red) talisman bookmarks for each of the 100 copies of The illustrated lyrics of Old Man Crow! this one relates to all the Hopeful Things with Feathers too! It’s like a trip around the world … no wait, it IS a trip around the world! Such blues, Mo, really glorious! And what a delightful collection you have made to display your talisman.